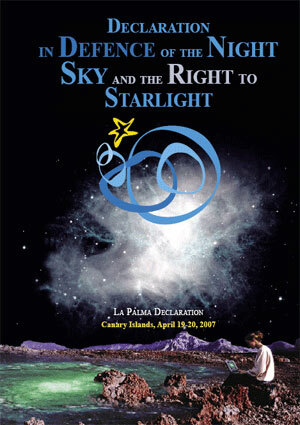 The participants of the International Conference in Defense of the Quality of Night Sky and the right to observe stars, jointly with the representatives of UNESCO, UNWTO, IAU, CMS, CBD, other international agencies named in the longer version, and members of the academic community, meeting in La Palma, Canary Islands, Spain, on 19 and 20 of April 2007, are aware that the Starlight vista has been and continue to be an inspiration of the mankind, and that its contemplation represents an essential element in the development of scientific thoughts in all civilizations. a. An unpolluted night sky that allows the enjoyment and contemplation of the firmament should be considered an inalienable right equivalent to all other socio-cultural and environmental rights. Hence the progressive degradation of the night sky must be regarded as a fundamental loss. b. Knowledge—armed with education—is a powerful vector that can heal the growing rift between today’s society and science and contribute to the advancement of the mankind as a whole. The dissemination of astronomy and of the scientific and associated cultural values should be considered as basic contents to be included in educational activities. d. Control of obtrusive light must be a basic element of nature conservation policies since their impact on several species, habitats, ecosystems, and landscapes. c. Protection of the astronomical quality of areas suitable for the scientific observation of Universe must be given priority in national and international scientific and environmental policies. e. The intelligent use of artificial lighting that minimizes sky glow and avoids obtrusive visual impact on both humans and wildlife should be promoted. This strategy would involve a more efficient use of energy so as to meet the wider commitments made on climate change, and for the protection of the environment. f. Tourism, among other players, can become a major instrument for a new alliance in defence of the quality of the nocturnal skyscape. Responsible tourism, in its many forms, can and should take on board the night sky as a resource to protect and value in all destinations. Necessary measures should be implemented to involve all parties related to skyscape protection to raise public awareness—be it at local, regional, national, or international level—about the contents and objectives of the International Conference in Defense of the Quality of the Night Sky and the Right to Observe Stars.